China launched a Turkish reconnaissance satellite Tuesday to supply optical imagery for civilian users and defense forces, according to media reports. 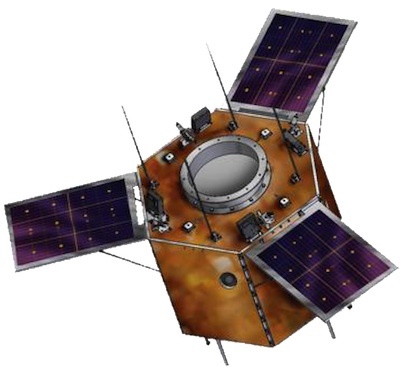 Artist's concept of the Gokturk 2 satellite. Credit: Turkish Aerospace Inc. The Gokturk 2 spacecraft lifted off on a Chinese Long March 2D rocket at 1613 GMT (11:13 a.m. EST) Tuesday. The launch, which originated from the Jiuquan space base in northwestern China, was at 12:13 a.m. Beijing time, according to the state-run Xinhua news agency. Built by Turkish Aerospace Industries Inc. and funded by the Turkish government, the Gokturk 2 satellite is beginning a five-year mission to collect imagery visible, near-infrared and shortwave infrared global reconnaissance imagery. Gokturk 2 is the second remote sensing satellite built by Turkey. Its imaging payload has a top resolution of 2.5 meters, or 8.2 feet, according to Tubitak, the Scientific and Technological Research Council of Turkey. Turkey will use Gokturk 2 data for security, disaster response, environmental applications, mapping, urban planning, coastal zone monitoring and water resource management, according to Tubitak. The optical payload will take pictures with an image swath width of 20 kilometers, or about 12 miles. The satellite's imagery will meet strict requirements set by the Turkish Armed Forces, according to Turkish Aerospace Industries. Gokturk 2 weighs about 900 pounds and will operate 435 miles above Earth. Turkey has contracted with Telespazio and Thales Alenia Space, two European satellite contractors, to develop another Gokturk satellite with 1-meter, or 3.3-foot, resolution. Tuesday's launch was the 19th and final scheduled space launch of the year for China. All of the missions were successful, setting a record for the Chinese launch industry. Last year, China attempted 19 space launches and was successful in 18 of the flights.